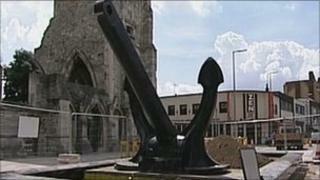 A 13 tonne anchor from the QE2 has been set as a landmark in Southampton. The 4.3m (14ft) by 2.7m (9ft) steel anchor has been gifted to the city by the Dubai royal family and Cunard. The anchor is one of a pair that hung on each side of the ship which made its maiden voyage on 2 May 1969 from Southampton to New York. It has been placed in front of Holy Rood Church which forms part of the QE2 Mile - a pedestrian path that links historical landmarks in the city. Cunard's president Peter Shanks said: "The anchor will ensure that her legacy in Southampton will endure for many years to come." "QE2 called at her home port of Southampton more times than any other port during her long and illustrious career so it is entirely fitting for there to be such a tribute to her in her home city." After sailing to Dubai from Southampton almost three years ago, the former Cunard flagship remains redundant. Following the global economic downturn, the plans to convert the ship into a floating 200-room luxury hotel and entertainment centre off Dubai's manmade islands are believed to be on hold. The 293.5m (963ft) long liner which carried almost 2.5 million passengers and completed over 800 Atlantic crossings is being kept idle but in a seaworthy condition in the inner harbour in Port Rashid.